With little fanfare, there has been a revolution-taking place! 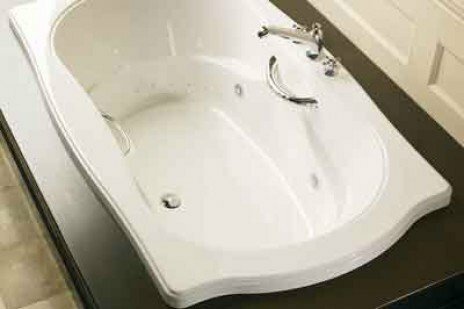 Over the last three years more and more residential customers and new homebuyers have chosen to include thermo-massage bathing systems rather than the traditional jetted whirlpool tubs for their new bath environments. Invented in the late 70s by a Canadian therapist, they have gained wide commercial acceptance as the fixture of choice in many day spas and better quality hotels and inns. Using forced air delivered to the bath water by as many as 60 small jets that surround the body, they offer a myriad of important advantages over traditional jetted tubs. Ability to use therapeutic aids like Epsom salts, sea salts and essential oils without risking damage to the tub. Since there is no chance that a past bathers water can be left in a pump or plumbing, its substantially more sanitary. To learn more about this new type of bathing system for your home log onto www.ultrabath.com or visit our beautiful design center for a demonstration of our functioning display.